When I was a kid, I would get home from baseball practice, turn on the TV and see the ending of a show. I didn't know what the show was but it had a couple sitting in a room full of stuffed animals saying good-bye. The next year I quit baseball (I think the team was happy about that) and finally got to see this show I wondered about the year before. Little did I know this show would change my life! The Shields and Yarnell show was a variety show featuring professional mimes Robert Shields and Loraine Yarnell. They were doing the 'robot' years before anyone ever heard of break dancing. My life changing moment came when I saw a segment of them doing mime on the streets. I watched with wide eyed wonder as these two mimes performed their art on the streets with unsuspecting people as they walked by. I had found my calling, I... would be a street mime! My parents would be so proud. As the years went by, I was a typical teen and got distracted by many things. I played hockey, learned harmonica, and even formed a band with my friends (a great two weeks). Even through all the distractions, being a street mime was always in the back of my mind. When I was 19 or 20 I finally decided it was time. I started to research street mime. I discovered a problem. Mimes seemed to clown around as people walked by. I wanted to draw a crowd, do a show and pass a hat! When did the mime pass the hat if people didn't stop and watch your show? Being the focused person that I am I decided I would be a juggler. I went to Toad Hall Toys in Winnipeg because I had heard they sold juggling equipment. A young man named Guy Bedard worked behind the counter. When I asked him about juggling stuff he asked me if I'd like to see some magic? Being the focused person that I am I said, "Sure." I wasn't prepared for what happened next. He pulled out a deck of cards and magic literally happened before my eyes. I was gobsmacked. My eyes popped out and and all I could say was, "Whaaaaa?!" I thought to myself, "Hey, I think I'll do that instead of juggling." As an organizer I’m always a little nervous about the event I plan, but as soon as Super Ron came into the room I felt better because I knew that he would put his best effort in. By the end of the show my cheeks were sore from smiling! He brought these organic farmers out of their shells and I saw sides of them that I didn’t know existed – like quiet and shy Wayne jumping up and down thanking himself! We have had a lot of compliments on his show and how fun the whole event was. Thank you Super Ron for being you and doing what you do! It is obvious that you love doing this! "Thank you for performing your magic show for our employee appreciation functions. Your performance was the crowning touch to our functions. The time you spent preparing and customizing your performance to meet the interests of the group was greatly appreciated." "Thank you very much for putting on a wonderful magic show. You captivated all the Little Sisters minds and even had the adults laughing. We really enjoyed your show and would definitely have you back ... I really believe your show saved the day. Thank you again for putting on an amazing show!!!" "Thank you on behalf of Riverside Country Club for performing for our Family Day event. Everyone who attended thoroughly enjoyed themselves and several mentioned to me personally how much they enjoyed your show. It was entertaining for both the adults and children present." "Ron's show was excellent and kept the audience (all ages) entertained for the entire hour. I would highly recommend Ron for any function that requires top notch entertainment!" 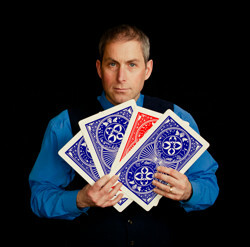 "The magic show was great, and what made it even better was the audience rapport that Ron was able to achieve. I am sure that if you hire him to perform for you, neither you nor your audience will be disappointed." "Thank you for the great show you performed for the Rowland Mitchener 'Just Say No' club. The students enjoyed their direct involvement in the show…You put a lot of time into preparing your presentation. You will likely be contacted by us again next year." "On behalf of the Saskatoon Police Association as well as many delighted youngsters, I would like to thank you for the performance during our Children's Christmas Party. 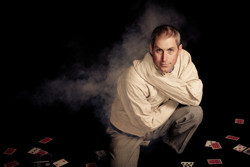 Your magic act contributed to a successful function that was enjoyed by all. I would be happy to recommend you to other organizations"
"Thank you for the amazing performance you gave us at our Volunteer Appreciation Day this week! There was much discussion following your show concerning many of your illusions; everyone seemed to have their favorite. I really appreciated how you designed your show for our particular audience, as you demonstrated by using the 'Volunteers are Magic' theme in various parts of the show. I must comment in particular, though on the strait jacket escape you performed while suspended upside down. You had me and the rest of the audience on the edge of our seats!" "Your show is indeed suitable for any age. At our facility, your audience was comprised of about 150 captivated people ranging in age between 1 and 90 something! I would be happy to recommend your show highly to any group or organization."